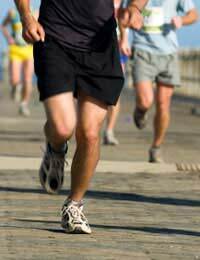 Cardiovascular fitness involves doing fitness work that makes your heart beat faster and your breath become deeper. While this can technically refer to most types of exercise, cardiovascular exercise is specifically working your cardiovascular system, which can be improved by doing cardiovascular exercises on a regular basis. Improving your cardiovascular fitness can help you to become a better go kart racer, as you will be less likely to become tired during a race or immediately afterwards. Cardiovascular fitness work is often done to build up general stamina and fitness. To do this, it is recommended that you do cardiovascular fitness work three or four times per week. Each session of cardiovascular fitness work should last for around half an hour. Having superior general fitness and stamina can give you both a physical and mental edge over your go karting competition. If you become physically tired during a race, it can impact on your concentration levels and make you less aware of what is going on around you. Your target heart rate is important when doing cardiovascular fitness work. Your maximum heart rate refers to the number of beats that your heart can produce on a theoretical basis. This can be calculated by subtracting your age from 220. Your target heart rate refers to the heart rate that you should aim to achieve depending on the intensity of your cardiovascular workout. Generally, this is somewhere between sixty and eighty per cent of your maximum heart rate. To measure your actual heart rate, you have several options. Find one of your major pulse points (ideally on the inside of your wrist, or just underneath your jaw) and count the number of beats that are produced in sixty seconds. Alternatively, a heart rate monitor will continuously keep track of your heart rate and removes the need to keep manually taking your heart rate. This is also useful to keep a continuous check on your heart rate while you are exercising to make sure that you are in line with your target heart rate. Low intensity cardiovascular exercise over a long period – This type of cardiovascular fitness work typically involves working at forty to sixty per cent of your maximum heart rate for a sustained period of time (usually forty minutes or longer). Popular examples include running and cycling. You should be able to hold a conversation while doing this type of cardiovascular work as it is not especially physically demanding. Medium intensity cardiovascular exercise over a fairly long period – This type of cardiovascular fitness work typically involves working at around seventy per cent of your maximum heart rate. Because it is more physically demanding, it can only be done for around half an hour. Your breathing will be deeper than during low intensity cardiovascular work, but you should still be able to exercise without discomfort. High intensity cardiovascular work over a short period – This type of cardiovascular fitness work typically involves working at between eighty and eighty-five per cent of your maximum heart rate. As it is physically demanding, a twenty minute session will usually be the maximum that your body can handle. Interval cardiovascular exercise – This type of cardiovascular fitness work typically involves combining low, high and medium intensity cardiovascular fitness work. For example, several minutes of cycling can be followed by one minute of gentle walking.